Travelling fast and light – well made, but at a price. 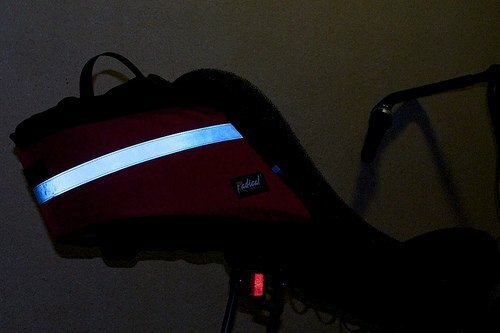 I recently tested the Bacchetta Corsa with a Radical Solo Aero bag, courtesy of Laid-Back-Bikes in Edinburgh. While I’ve previously written about Radical’s excellent Banana Bags, which are akin to panniers in size, at 12 litres the Solo Aero is better thought of as a stand-in for a saddlebag on a conventional bike. Unlike a saddlebag, of course, the Solo Aero fits tightly behind your body and will not contribute significantly to aero drag (it might even make a modest improvement, although I doubt you could measure this without instruments). It comes in five striking colours to suit any paint scheme. The Solo Aero hangs over the back of a narrow seat – the fit is excellent on both the Corsa’s mesh seat and the hardshell seats of the Raptobike midracer and Nazca Gaucho. 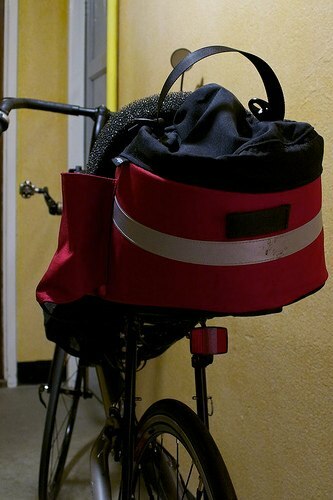 In fact the bag is available in two widths but isn’t designed for really wide meshes (such as those found on ICE trikes) however hard you try! There are no ‘controls’ – you just drop the Solo Aero over the seat back. To remove, grab the convenient carry handle and pull. Superb for cafe stops or brevet controls! 12 litres is a little bigger than the Carradice Barley or Pendle but not as big as the Nelson; if it helps, it’s about the same size as one lowrider pannier such as an Ortleib front roller. While you wouldn’t tour with this bag alone, it’s certainly more luggage than many riders take on Paris-Brest-Paris and would still compliment a touring load, when you might like to put your valuables and easy access items in the Solo Aero. If this isn’t making the most of your seat real estate, you can go as large as 30 litres with a Radical ‘Rackbag Extended’ (but that’s another story). An aluminium stiffener means that the Solo Aero holds its shape completely whether empty or full, and makes it a joy to access. One internal pocket will keep wallet etc. separate from whatever else you are carrying. The left side of the bag features a fabric bottle holder. While this will hold a bottle very securely, I found it difficult to reinsert the bottle on the move after taking a drink – some kind of stiffener around the lip would be an improvement here. The main double zip (nice touch – open to either side) is protected by a hefty storm flap. While not waterproof, the Radical Solo Aero will do a good job of protecting your cargo. The bag also comes with a quick-release shoulder strap that can be attached to two hardpoints for carrying the Solo Aero ‘hands free’. 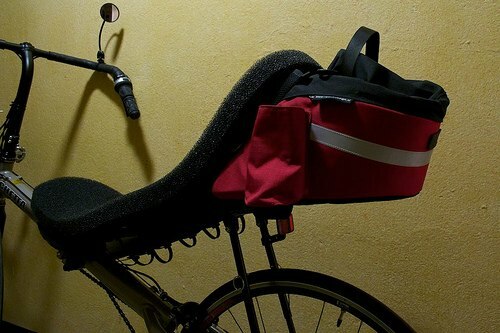 Finally, but not least – the bag acts as a reasonable mudguard, keeping road debris away from your head (although not, of course, away from the rear brake and lower half of the bike). Again, nobody buys Radical Bags to save money – the Solo Aero is listed at 120EUR (£100 / $150). 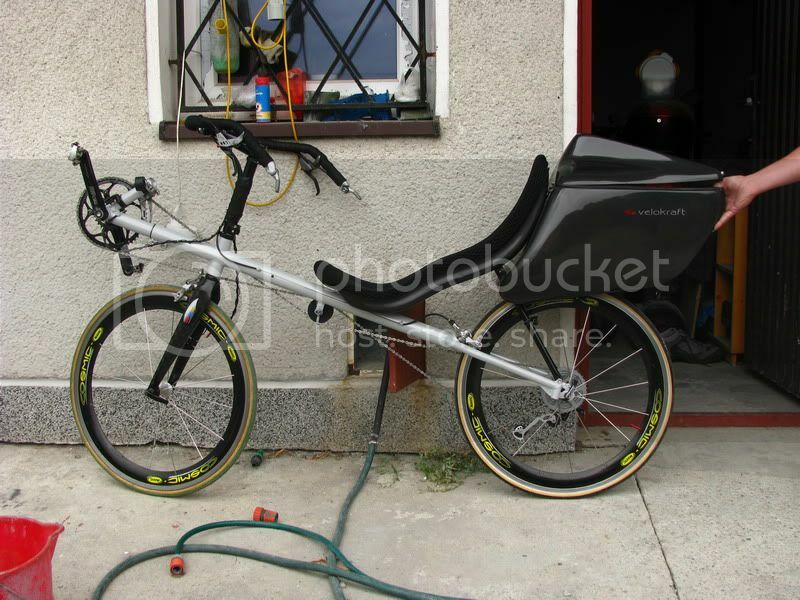 If you have a go-fast bike then your choice for aero carrying capacity boils down to this or the Solo Classic (which is smaller and significantly lighter, but comes without bottle holder and has reduced rear-wheel clearance), or the Solo Racers (which sling either side of the seat like miniature Banana bags). If you have the tyre clearance, the Solo Classic / Aero will certainly not slop about as I imagine the Solo Racers might (based on the larger Banana Bags, at least). At the end of the day you can’t go far wrong with any of the above, but the rigidity of the Solo Aero, and the bottle holder (if you can master it on the move), will both be big pluses in daily use. You can take a look at the range at Radical Design, but I’d encourage you to get in touch with your local dealer, aka Laid-Back-Bikes, for some personal service. Yeah, great bag. But not as high quality and tough as one may might think at first. The mash thing that goes over the seat is now pretty much for retirement on mine. and sew it on the back instead of the partial mash thing. And that’s after just one year of usage, and that’s pretty light usage, no commuting, frequent removal or anything like that. The edges of the velokraft carbon seat just sliced it up. Although the bottom is reinforced, the fabric that covers the alu strip literally melted after one contact with the rear tire. By the time I realized that it was rubbing against the wheel, it was already melted. Couldn’t really hear or feel anything while riding, cause of the traffic and wind noise. Edge of the seat just sliced trough the “ribbon” and started the chew the mash itself. from the wheel spray, and from the rain above. Anything in contact with the walls will get wet, and pass it on further. Can’t figure out why they don’t include a rain cover (could also keep it clean), or at least a fully water proof bottom. Why would anyone put a weak mash with two thin edges on the ends, on a 120 euro bag is beyond me. It’s not like it goes over the seat pad, so it would need to be breathable. It could also use some more stiffeners, especially one on the seat size, cause getting things out of the little pocket why digging between the seat ribs is not exactly fun. 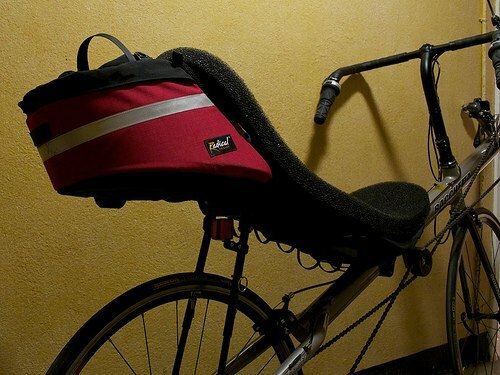 All in all, it’s no wonder that people started making their own bags, like BenUp Cycles,etc. and there is no way that I can fit a camelback bladder in there. Thanks for that – does your carbon seat have edge trim, or is it just the raw carbon edges? The carbon / VK seats I’ve seen (including mine) have sort of wrap around black rubber sealing and I’d be pretty surprised if that sawed through anything? What have Radical said about this? Oh, and I have a VK tailbox – I just haven’t written about it because I was under the impression it was pointless, as nobody else could buy one. Think I need to email Kamil myself. Igor, it may not be large enough for your brevet packing, but by most day cycling standards it’s pretty massive. I like the mesh as it maintains the breathability of the euromesh – though I can see it would need protection from sharp edges. Certainly agree it would be an improvement to fabricate from laminar sailcloth. I also think a dayglo colour option would make sense as it is a prominent feature from behind. Also totally agree about the bottleholder top, I use a bladder system. Overall worht the high price to me. Just raw carbon Dave. While the edge is nothing close to knife sharp, and it’s not as sharp/rough as with an fiberglass seat, it IS thin so it sure has it’s fair part in slicing the mash up. I’ve seen those ‘rubber’ trims on some ‘factory’ bikes, but I’ve never got any from any seat manufacturer, nor they advised me to use one. i think this part of the bag should have been made more robust. Agree with Paul on the volume. It’s indeed huge by DF standrds 😉 and very spacious for day riding. But then again, we can not exactly put a backpack on our back should we need more packing space, as DF riders do. So some smaller additional packing space elsewhere on the bike is needed, or just one larger tailbox if one needs to take more stuff. so it’s really hard to reach them. But as I’ve mentioned elsewhere, I often go to Poland so i just show up at the shop and get what I need. It seams the only way to work with Kamil at this time. but won’t make any NoComs till they make new molds, as old ones are in such a shape tat they require lots of manual labor to get them pretty after the frame pops out of the mold. Not sure about the VK3 and HI availability. probably I can get it done and shipped to you the next time I visit Krakow. I agree with Igor, the mesh holding the bag onto the seat is way to weak. 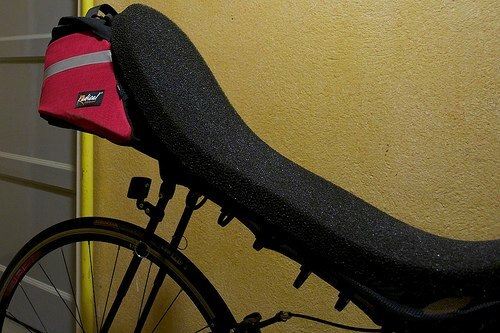 I have a kevlar seat, and I have rounded the edges, but no rubber lining. The mesh wore through in no time. I then reinforced the mesh with Liquisole polyurethane glue. This works, but looks awful on an otherwise neat bag. 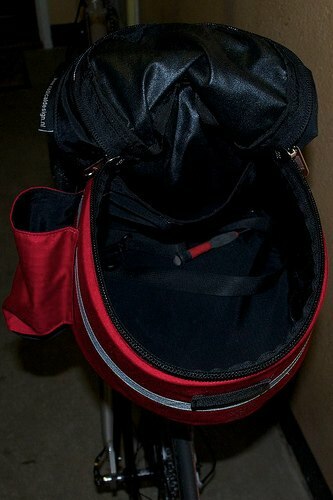 The bag I use for commuting now is a classic Carradice cotton duck saddle bag. I cut two notches near the top of the seat, and put a 20mm strap in a loop through the bag. Now I just hang the bag over the top of the seat, just as easy as with the Radical. And almost as aerodynamic. And almost impossible to wear out in my lifetime.